Judicial Administration: St. Paul, Minnesota (Municipal Court Law Clerk); 19?? to 19?? Military: National Guard; 19?? to ? Special Legislative Concerns: governmental operations, finance, commerce, energy, housing. He was murdered in Minneapolis, Minnesota. His funeral was held at St. Casmir's Catholic Church in St. Paul, Minnesota. He was buried in Roselawn Cemetery in Roseville, Minnesota. Session Notes: He resigned to become the Director of the Minneapolis Municipal Employees Retirement Fund (MERF). 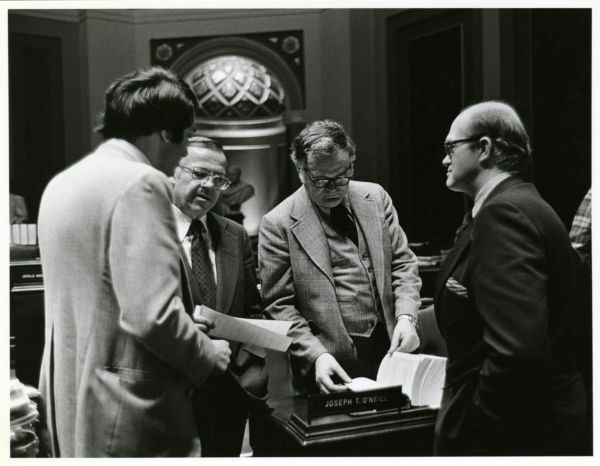 Senator John Chenoweth, Senator Harmon Ogdahl, Senator Joe O'Neill, and Senator Howard Knutson discuss legislation on the Senate floor, St. Paul, Minnesota. 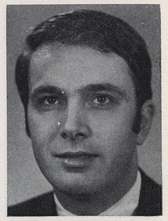 "Rites Set for John Chenoweth (Obituary)." Minneapolis Star Tribune, August 15, 1991. Brunswick, Mark. Chenoweth Identified as Man Slain on Beach. Minneapolis Star Tribune, August 13, 1991, p.1A.